ROMANCE BOOK PARADISE: Sarah Morgan, A Night of No Return GIVEAWAY! 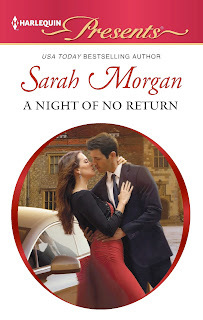 Sarah Morgan, A Night of No Return GIVEAWAY! We have UK author Sarah Morgan talking to us about her - A Night Of No Return! A Night of No Return….. Thanks Nas for inviting me here to talk about my November release for Harlequin Presents, A Night of No Return. This is my first ‘office’ romance since my RITA winning book Doukakis’s Apprentice (although it’s worth noting that none of the action takes place in an office - the book moves from the hero’s castle in England to the desert country of Zubran without going near a glass tower block!). Personal Assistant Emma Gray, a hard working and dedicated professional, finds herself trapped in a lethal snowstorm with the man she works for, internationally renowned architect Lucas Jackson. She has made a vow never to get involved with her boss but, by the time the night is over, Emma's life will have changed forever. I loved writing this story so much. Emma is such a decent hard working girl it was fun to bring sparkle and romance into her life and Lucas has been so damaged by his past he deserves a woman like Emma. If I had to find one word to describe the heroine in this book it would be ‘loyal’. What one quality do you think is important for a heroine? One commentator, chosen by Nas, will win a copy of A Night of No Return. Check back to see if you’re the winner! I hope loyalty is an important character for a heroine, because the one in my next book has that quality, too. Sounds like two very interesting characters. Loyalty is definitely an important quality! Glad you agree on the importance of loyalty Sherry! Hi Suze, yes I agree that dignity is a lovely and important quality in a heroine. Sarah, isn't it lovely to hear you enjoyed this story so much yourself, which probably means your readers will also. Very generous of you to give away a copy. Hi Eli, yes I agree that strength is an important quality in a heroine, particularly if the hero is very strong. Good luck with the giveaway! Hi Morgan, and I really hope you're right about good things coming my way :) I'm excited too - I love this duet so much. Thanks for dropping by! Oh Sarah Morgan, you are in sooo much trouble. What is it about your books that I always seem to pick them up last thing at night and CANT PUT THEM DOWN. Just finished Night of No Return at 3am in the morning. Am desperate for Avery's story. She should be a woman with a point of view of her own. Someone who is not afraid to assert herself. My reading of romance novels was somewhat marred in the past by insipid heroines. I like heroines who are loyal, good humoured and trustworthy. And yes, who know how to speak up for themselves. Ahh, looking forward to this one. But that's perty usual, I can devour your books though, Miss Ma'am. Hi Amalie, so glad you enjoy my books! I enjoy a gutsy heroine too (Emma is gutsy, but in a quiet steady way - Avery in the next book is loud gutsy!) Very happy that A Night of Scandal is on your keeper shelf! a strong heroine but has to be kind and loving to. Hi Taylor! I'm totally with you on kind and loving. I think Emma in A Night of No Return totally fits that description fortunately. Thanks for dropping by! Hi Sarah (and Nas) I so love a strong, gutsy heroine! Loyal yes but one who is able to speak up for herself! Can't wait to read your November book! November is my favorite (birth) month! Hi Evy! So glad November is your favourite month - I'm hoping it's a lucky month for me, too :) I love a strong gutsy woman too! Really hope you enjoy A Night of No Return. I like a heroine who is strong and independent. I also think that loyalty is a great trait or quality for anyone to have. This sounds like a good book with an interesting plot! Thanks for the introduction and the giveaway. Hi DMS, I agree that it's important for a heroine to be independent. Thanks for dropping by! I like a heroine who's honest. Chey, yes honesty, I agree. So important. It's interesting to see what people do when they're stuck together or stranded somewhere. My heroine right now is very independent - I love that in a heroine. Loyalty is important, too! I agree with the above-noted attributes being important to a heroine. The first thing I thought of was what I LIKE to see in a heroine (and a hero): witty repartee. Nothing makes me smile or laugh as getting to witty banter between the hero and heroine. Those are the parts of the book I go back to read, time and time again. They are also the reasons I re-read entire books. Last year, I was waiting for ages at my local clinic, so OF COURSE I was reading a book. (Duh!) I was totally immersed in Kathleen O'Reilly's DEAR SANTA... - in Blaze's trilogy called A BLAZING LITTLE CHRISTMAS - and I LOL and then teared up not four pages later. I have never read a book that evoked such contrast in emotions so close together - and I don't recommend it in a waiting room filled with lots of people either, LOL. Congratulations to Sherri Ellis! Her name came up as the winner for A NIGHT OF NO RETURN! Please contact Sarah via her website about getting your prize! Thanks to all my lovely friends for coming along to read this post and commenting. And thanks to Sarah Morgan for being with us and for this giveaway! Thank you! I am so excited! I can't wait to read it.